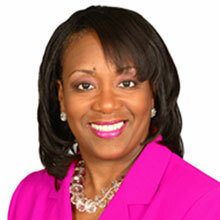 Dr. Saundra Wall Williams is the founder of T.E.A.C.H.Dr. Saundra Wall Williams (Teach and Educate for Active Christlike Holiness™), Inc. in Raleigh, North Carolina. She is indeed a woman of excellence and action whom God has chosen for ministry to teach, preach, speak and write to the spiritual needs of women. She is a powerful speaker who has dedicated her life and ministry to teaching so that others can move to active Christlike holiness. Through the direction of the Holy Spirit and the covering of her pastor, Dr. Williams has established T.E.A.C.H., Inc. The mission of T.E.A.C.H. is to equip and encourage women for their life and ministry calling through a holistic teaching approach. T.E.A.C.H. is working to maximize the ministry potential of women all over the world in God’s Word. This mission is accomplished through dynamic and anointed seminars, study materials, small group study sessions, conferences, retreats, and mentoring. Headquartered in Raleigh, NC, T.E.A.C.H. concentrates on TEACHing™ in SPIRIT and in TRUTH. Dr. Williams received her call to the ministry in 1996 and was licensed in the gospel ministry in 2000, and was ordained as Elder in the Full Gospel Baptist Church Fellowship in 2005. She stands as an obedient, yielded woman of God. In doing the work of the Kingdom, Saundra is the Elder of Christian Education at Solid Rock Ministry International in Garner, NC where Bishop L. Foday Farrar, Bishop of Global Affairs for the Full Gospel Baptist Church Fellowship, is her Pastor. In this role, she is responsible for all adult education at SRMI. She was recently appointed by District Overseer Luther Brooks as the District Director of Christian Education for the Full Gospel Baptist Church Fellowship International Central District. Dr. Williams is currently the Sr. Vice-President and Chief of Technology and Workforce Development for the North Carolina Community College System. Before coming to the Community College System, she was a professor at North Carolina State University and prior to that, worked 13 years in business and industry in the areas of information technology and training. She holds a Bachelor of Science in Mathematics, Master of Science in Applied Mathematics and Statistics and a Doctor of Education in Adult and Community College Education from North Carolina State University. She also holds a Master of Divinity from Regent University. She is also a certified Christian Coach, where her specialty area is women in ministry. She feels that her professional and educational achievements were only preparation for God’s Kingdom building assignments. Dr. Williams was born in Rockingham, NC and is the daughter of Mr. Leon Wall, Sr. and Mrs. Pauline Patterson Wall. She is a 1981 graduate from Richmond Senior High School. Saundra is married to Mr. Dennis O. Williams and they celebrate 21 years of marriage. God has blessed them with one son, Bradley Joseph.